Volatile organic compounds (VOCs) are one of the most vital areas for governments to monitor for pollutants and personnel safety. There are great needs in monitoring households, laboratories, planets, oil pipes, chemicals transports, etc., to prevent leakage and exposures of VOCs. In this project, novel nanocomposites thin films fabricated from conducting polymers and nanoparticles were invented by Prof. Wei-Fang Su of National Taiwan University. 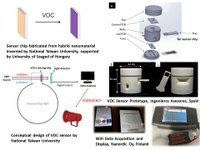 The thin films were used as highly sensitive sensor chips, aiming for low costs, high sensitivity and portable VOCs sensing system. The dramatic morphology and crystallinity changes of thin films upon the intake of VOCs vapor lead to higher absorption. Warning sets off to notify personnel once the absorbance of sensors is changed. In situ sensing system has been built according to special design for the project. We made a prototype volatile organic compounds sensor that can detect toluene down to 100 ppm level which is complied with OSHA regulations. The development is still on going in National Taiwan University. The new version sensor can detect VOC down to ppm range (present in 2017 MRS Fall meeting). We incorporated wireless communication into the prototype that can monitor the VOCs detection online through WiFi and internet. The results of this program were published into 32 scientific papers in flag scientific journals such as Analytical Chemistry, Journal of Material Chemistry, etc. Two Taiwan patents (I452288 and I537562), one US patent (9146222) were awarded to National Taiwan University. The program provides an opportunity for Taiwan to work together with European scientific community not only on the technical side but also culture side. The relationship among participating countries is enhanced. We continue to collaborate on nano material research and development especially with Hungary and Finland. An internship program is built with Finland. We have a new MERA project (2017-2020) with Hungary and Netherlands on transparent perovskite solar cell (CLEARPV). 6. Please see our website: www.vocsensor.com for details.